Well, maybe third time will be the charm? 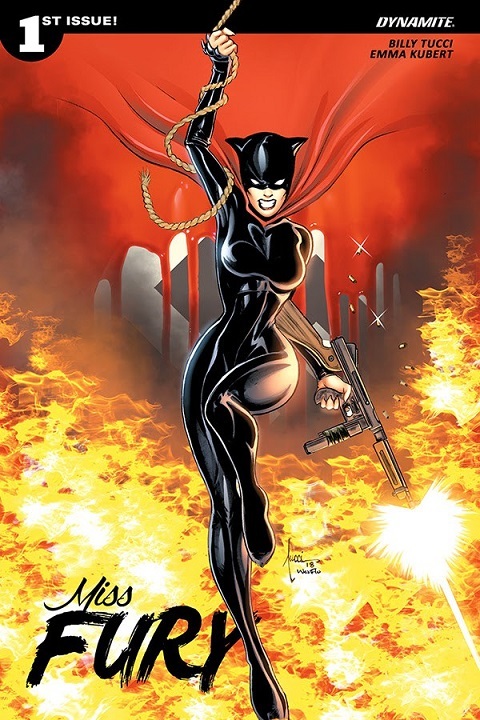 First, Dynamite gave us an 11-issue Miss Fury series written by Rob Williams and with pencils by Jack Herbert that came out in 2013-2014. Then, in 2016, they tried again, this time with a 5-issue run written by Corinna Bechko and art by Jonathan Lau. Now, word is that Billy Tucci and Emma Kubert will be giving us Miss Fury: Joy Division, with the first issue expected to available in October of 2018. Edit: wow, apparently pu$$y is a rude word! I bought the first series, but had no idea the second even existed. "Ms." wasn't really used back before the 1970s . . .
Well, the first issue of this series was suppose to be available this past Wednesday (10/3/2018), but it appears to have been delayed? MajorHoy wrote: Well, the first issue of this series was suppose to be available this past Wednesday (10/3/2018), but it appears to have been delayed? It always seemed to me Dynamite was notorious for not keeping their books on the schedule they were originally solicited at. Just have to wait and see what finally happens with this one. Well, they had a date of "Dec 26, 2018" for issue #1, then it was listed as "In Shops: Jan 02, 2019" sometime in November, but before the end of that same month, Previewsworld had it as moving to "In Shops: Apr 24, 2019". Of course, they haven't gotten around to updating the dates of Issue #2 ("In Shops: Jan 23, 2019") or issue #3 ("In Shops: Feb 20, 2019") again yet. MajorHoy wrote: Well, they had a date of "Dec 26, 2018" for issue #1, then it was listed as "In Shops: Jan 02, 2019" sometime in November, but before the end of that same month, Previewsworld had it as moving to "In Shops: Apr 24, 2019". but I'm guessing issue #3's date will be changed in the near future to possibly June 26th, 2019? Actually, it appears the date has been moved AGAIN, this time to "September 25, 2019"!!! I'm still enjoying Red Sonja and Thunderbolt.